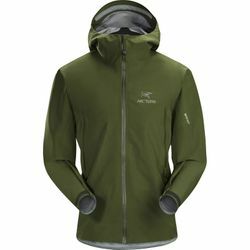 ARC'TERYX Zeta LT Jacket. The Zeta LT delivers weather protection during extended trekking and backpacking trips. Lightweight, comfortable and compressible, it is made from N40p-X 3L GORE-TEX fabric with GORE C-KNIT backer technology. This material delivers longwearing waterproof, windproof, highly breathable performance with a backer technology that makes the fabric exceptionally supple, quiet and comfortable next to the skin. The Arc'teryx Trim fit keeps the shell close to the body to improve the fabric breathability, but leaves room for light layers. Articulation in the sleeves and gusseted underarms provide freedom of movement. The patent-pending 3-layer GORE-TEX fabric with GORE C-KNIT backer technology provides protection with exceptional comfort. The proven bi-component GORE-TEX membrane system is bonded to a dense, extremely thin circular knit to form a supple, less bulky, durable laminate that is more breathable and lighter weight than previous constructions. The circular knit's soft, smooth texture is comfortable, quiet, and helps the Zeta easily slide on and off over other layers. The Zeta LT is made for extended journeys, and at 335 grams (11.8 ounces), it travels light. This required discipline in the design, so features focus on protection without adding extraneous weight and bulk. The low profile Arc'teryx StormHood delivers full protection and cinches securely with a single adjuster for a fit that moves with the head and provides exceptional peripheral vision. The hip length with drop back hem extends coverage and rides comfortably under a hipbelt. An internal laminated pocket stows and protects a smartphone or wallet, and two hand pockets with WaterTight zippers are accessible while wearing a pack or harness.